Five things I'm loving or lusting after at this very moment. 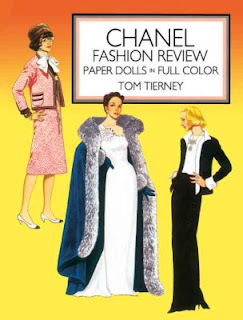 Chanel paper dolls. I came across this gem in a lovely serendipitous twist and placed an order via Chapters. I'll let you know how it is! Dover Publications also puts out paper dolls for Dior, YSL, and other notable fashion designers of the twentieth century, as well as CD-ROMs that catalogue notable looks by last century's most infamous designers. These publications make great gifts for paper doll enthusiasts, budding designers, and fashion history fanatics. Imeem. Ever since Batanga.com revoked its worldwide streaming Latin music stations, I've been suffering severe Latin pop withdrawal. I miss my daily fix of RBD and reggaeton! Thank goodness a coworker introduced me to Imeem. Sign up to create your own playlists, run searches for certain artists, or listen to other people's playlists. My white and silver scarf from H&M. I wore it the other day with a black jersey top, trouser-cut dark denim jeans, pearl stud earrings, my black-and-white tweed Ralph Lauren flats, and my Chanel sunglasses. Timeless, classic, and chic. My brown suede kitten heels. I wore them for the first time in probably over a year yesterday, and gosh darn it, I'd forgotten how comfortable they are! Audrey Hepburn was onto something when she worked the kitten heel in the sixties. An Engineer's Guide to Cats. Watch this video and laugh until you cry, then calculate the aspect ratio of your household pet.